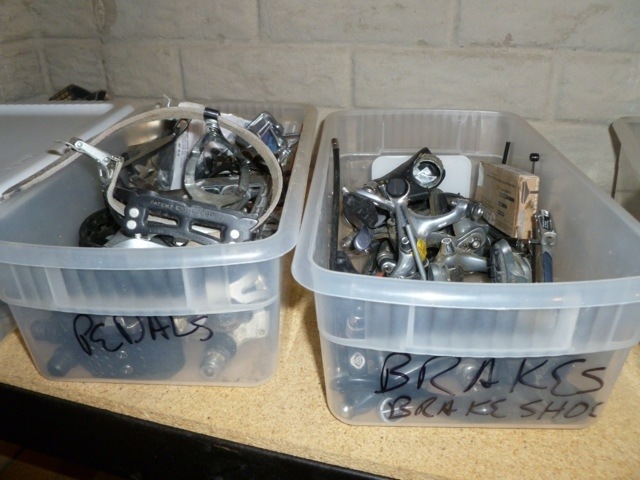 I’ve had junk boxes with bicycle parts in them for as long as I’ve had bicycles. The first box, established around 1971, contained one thing: a broken coaster brake axle. The only reason I kept that was to look upon the proof that I had successfully revived the rear hub on my red Sears Hawthorne after a close reading of Glenn’s Bicycle Manual and a trip with Dad to Illinois Cycle Shop in Peoria for a replacement. The broken axle was eventually joined by bits and pieces of other bikes: hubs, rims, spokes, handlebars, cranks, chainrings, nuts, bolts and washers. Few bent, broken and/or rusty bicycles were ever so far gone that they couldn’t make at least a small contribution to the collection. The Made in America stash mostly disappeared when I left it behind and headed for college. It included Bendix two-speeds (manual and automatic), New Departure coasters, any number of Wald stems—all gone. Let’s just say Mother did ask about getting rid of the stuff and was especially energetic about its disposal. Sad about the loss? Maybe, but I was traveling light back in those days. I didn’t really miss the big pile o’ iron in my parents’ basement. Several years after college I launched the Mostly Euro Trash collection. It grew to include French derailleurs and chain, Japanese brakes and brake levers, Italian handlebars and stems, Swiss spokes and Spanish freewheels. Good stuff, great stuff, but again, too much stuff. Some of it came in handy from time to time, but almost all of it disappeared in the Great Divestment of 2002, prior to the move into a new house. A new house doesn’t stay new for long, and the Steve Martin That’s All I Need Memorial junk box set began. But this time I had a strategy: nothing broken, nothing rusty, no collecting for collecting’s sake (mostly). For that reason, my third set of boxes contains little actual junk, just parts that I don’t happen to be using at the moment; maintenance parts such as new cables, cable housing, cassettes, chain and inner tubes; and parts that are just too good not to reserve for something unforeseen, someday. 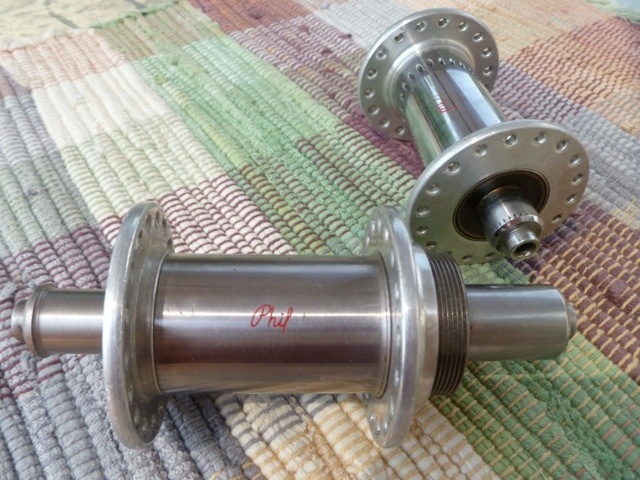 All of which brings me to today’s junk box find (anything I forget I have constitutes a find): a pair of pre-1978 Phil Wood hubs—perfect for rehabbing Les Siegrist’s old Schwinn Sports Tourer, now referred to as the Les Schwinn is More project. The front sealed-bearing hub would be a great addition to any bicycle, new or old. And the beefy rear unit may be obsolete by marketing standards, but it still has thousands of miles in it. I just need to spread the Schwinn’s five-speed frame a few millimeters to accept the wider six-speed hub. In any case, getting the Phils on the road would free up a little room in the ol’ junk box. For what? This entry was posted in Becoming a bicycle, Equipment, Schwinn Sports Tourer and tagged junk boxes, Phil Wood, Schwinn Sports Tourer. Bookmark the permalink. Sometimes there comes a great notion, but that’s another kind of story. And notion stores are pretty well obsolete. On the other hand(s) I’ve expanded my own collection of plastic containers with lids to “organize” the shine-y bits by function. The one with the most collected wins, but I’m not sure what. Mass, or inertia, or just bins of wonder and delight. Back in the day, one of my favorite activities was the local bicycle club’s swap meet. In the early days there was always something to see: including the tackle boxes of one rider who also happened to be a machinist. If there was a small steel part that could be executed in aluminum, he had it. As time went on and drivetrains standardized around a certain chain with a certain cassette with a certain derailleur, I sensed the interest in older, open-standard parts diminished. There are still some great swap meets around the country, though: Ray Keener keeps going on about the one in Boulder, Colorado.